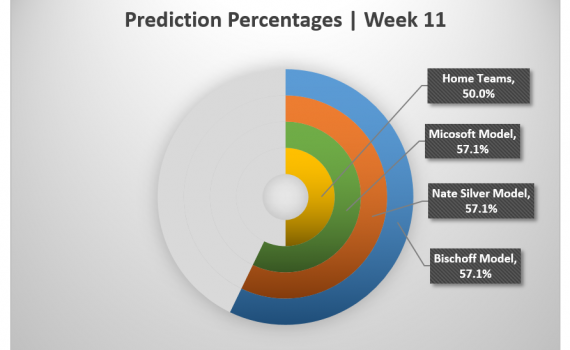 The Bischoff NFL model is coming off of a very rough week with only 8 out of 14 games predicted correctly, which brings it’s total record 108-52-1. Luckily for the Bischoff model, its peers also performed poorly as Nate Silver’s ELO model as well as Microsoft’s Cortana both had identical percentages. While a lot was at play this week, some notable upsets were Denver at St. Louis, Houston at Cleveland, and Cincinnati and New Orleans. All models had Denver, Cleveland, and New Orleans. This overturned many impressions on the strength of the Broncos heading into the playoffs. Additionally, Cleveland’s claim over the AFC North was short lived after the Houston game, which they have found themselves at the bottom of the division. 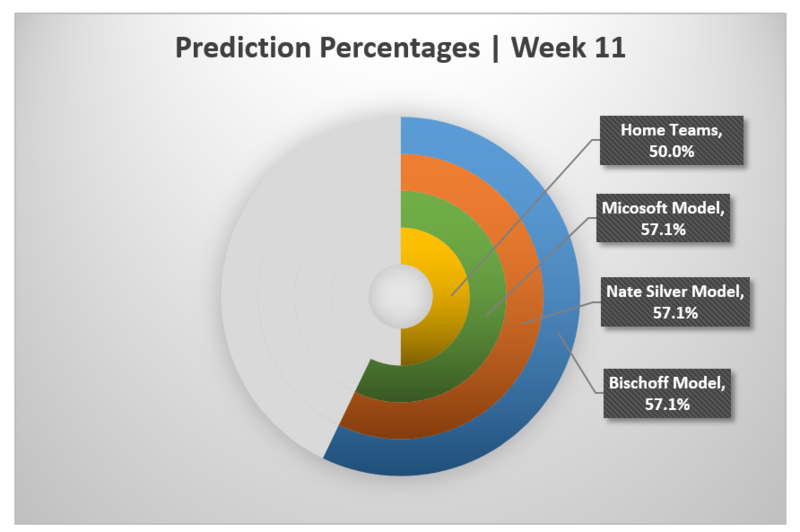 Moving on into predictions for Week 12, the Bischoff model seems to stray very much away from both Microsoft’s Cortana and Nate Silver’s Elo in some areas. Key games to watch for the Bischoff model are Baltimore at New Orleans and the redemption of Cleveland at Atlanta. For those of you just joining, these disparities come from the different ideologies on how the models are built, importance of factors included, as well as what factors are included in the first place. 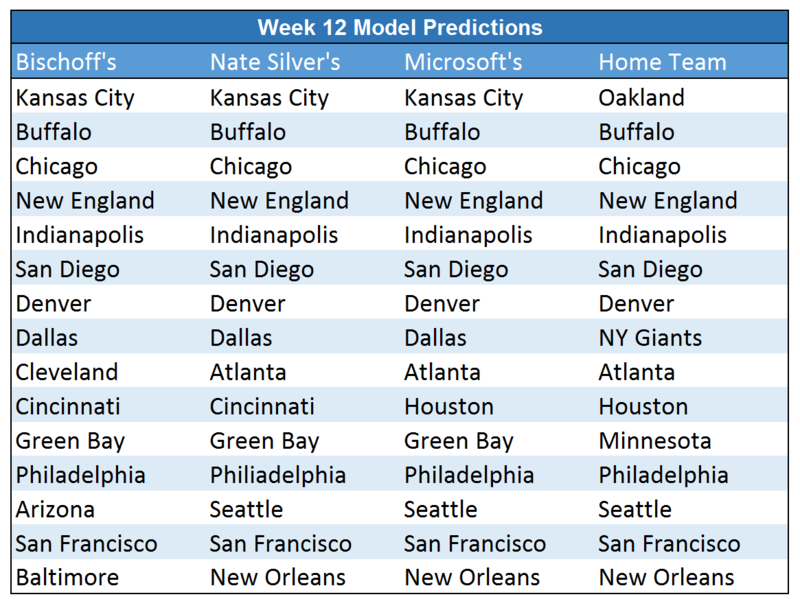 While most of the game predictions are the same, the outcome of Week 12 will prove interest on the two previously mentioned games as well as Microsoft’s prediction of Houston winning at home over Cincinnati. That’s a very impressive model you’ve got there. You are so awesome! I do not think I have read something like that before. So wonderful to discover another person with a few original thoughts on this issue. Really.. thanks for starting this up. This web site is one thing that is needed on the web, someone with a bit of originality!